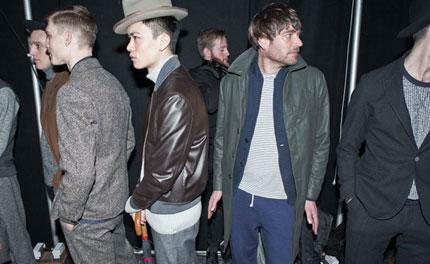 Oliver Spencer is a popular guy, or so one would surmise after his A/W 2014 men's show, where even a burst water main pre-show didn't stop actor Jack Guinness and Blur's bassist Alex James walking the (somewhat damp) catwalk for the designer. Not unlike a recent Dries Van Noten show in Paris, a live drummer set the scene for Spencer's casual tailoring collection, that took advantage of the diverse, multi-generational casting to add authenticity to wide, cropped and mismatched suiting in mealy, flecked tweeds. Spencer's attention to detail came through in subtle idiosyncrasies, like the contrast buttonholes or buttons down a blazer front, and the intricate denim-like jacquard that signalled his update on the camouflage trend.